On 11 August 1917, Dyson travelled to Nieuport, Belgium, where he visited Australian soldiers tunnelling through sand dunes in order to destabilise a German post. In July the 2nd Australian Tunnelling Company suffered a significant loss when many of its members were captured following a German attack. With the tunnellers near Nieuport is one of two lithographs that resulted from Will Dyson's time in the region. 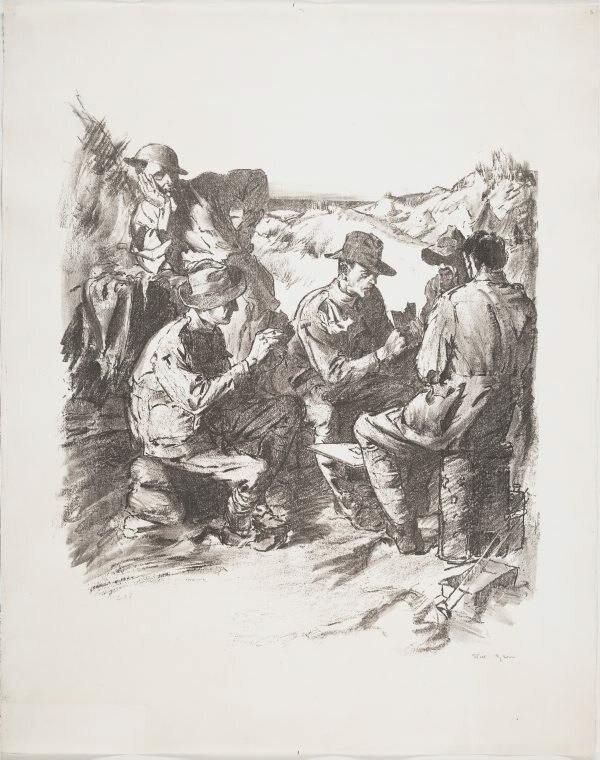 Dyson's scene suggests an unspoken, silent comradery among the figures, which has the effect of universalising the image to a degree, while simultaneously retaining the distinctly Australian nationalistic idea of mateship. Playing cards were issued with the aim of boosting morale and national pride. Dyson exemplifies in the five tunnellers, an unflinching perseverance. Signed l.r. corner, pencil "Will. Dyson". Not dated. Ross McMullin, Will Dyson: Australia's radical genius , 'Chapter 3: 'THE WAR HAS ALTERED HIM A LOT' Holocaust 1914-1918', Australia, 2006, 171, 172, (illus.) 173.